If Liverpool’s 2005 success was known as the Miracle of Istanbul, given the nature of their comeback from 3-0 down to win on penalties, Barcelona and Arsenal would have probably liked to have been victors of a much calmer final in 2006. 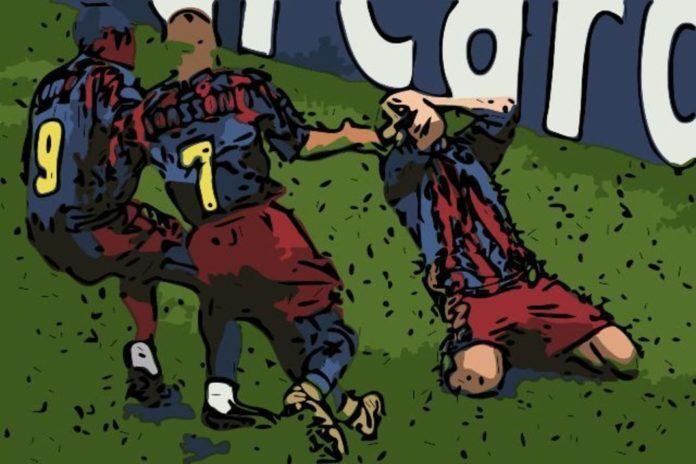 Whilst the Stade de France – the host stadium of the final – didn’t see quite as much drama as Istanbul did 12 months earlier, it was still a chaotic Champions League final that had plenty of twists and turns. For Arsenal, it turned out to be a match of huge importance, perhaps more so than for Barcelona, managed then by Frank Rijkaard. They had already agreed a deal to play at the new Emirates Stadium from 2006/07 season onwards, leaving Highbury, the home of the Gunners for 93 years. Crucially, Arsene Wenger had committed his future to the club, with Arsenal’s financial future up in the air. The Frenchman said later that the banks needed technical consistency to guarantee that there would be a chance that the club could pay them back – that essentially meaning Wenger needed to stay or Arsenal’s future was at risk. He did stay, but under huge financial restrictions, and there was a sense that this could be Arsenal’s best shot at a Champions League final for many years, both pre and post 2006. The Arsenal side of 2006 contained talisman Thierry Henry, Robert Pires (who played his last game for the club in Paris), Ashley Cole and Alexander Hleb. In fact, when Arsenal met Barcelona four years later in a Champions League quarter final, none of the players who started in Paris were in the XI, although Robin van Persie, Emmanuel Eboue, Gael Clichy and Cesc Fabregas, who all featured in the eighteen, were still at the club. Remarkably, Arsenal did not concede a goal up until the final in the knockout stages of 2006’s competition, beating Real Madrid, Juventus and Villarreal on their way to the final. Barcelona conceded twice, both of those goals coming in two classic legs against Chelsea which are best remembered for Ronaldinho’s late tie clinching goal at the Nou Camp. The final itself started quickly in front of 79,500 at the Stade de France, Arsenal showing no nerves in their first ever appearance at UEFA’s showpiece event. They had the first chance early on, Thierry Henry shooting straight at Victor Valdes, whilst Jens Lehmann kept out Frenchman Ludovic Giuly at the other end. Lehmann was involved in the game’s biggest controversy on 18 minutes, bringing down Samuel Eto’o outside the box before being shown a straight red card, the German couldn’t really have any complaints. Wenger responded to the sending off by taking off Robert Pires for substitute ‘keeper Manuel Almunia, the game in Paris proving to be Pires’s last in an Arsenal shirt. Pires said that this substitution showed he had slipped in the eyes of the Arsenal manager, and was a key reason behind him leaving Arsenal after six years. Arsenal were expected to struggle after going down to ten men, and had to absorb more pressure for the remainder of the half. However, it was the Gunners that opened the scoring on 37 minutes, captain Sol Campbell rising highest to head home past Valdes. Almunia made an excellent save to turn Eto’o’s effort around the post on the stroke of half time, and Arsenal crucially went into the interval level. Barcelona came out for the second half having made one change – 22 year old Andres Iniesta coming onto the field. Iniesta had seen a proposed loan move to Rangers fail at the beginning of the season, then Gers manager Alex McLeish having submitted a bid to the La Masia chiefs in the summer of 2005. They had originally attempted to sign Lionel Messi, who was not in Barcelona’s squad for this final due to injury, but were advised to loan Iniesta instead. The move was close to completion when Iniesta scored in a big pre season game, convincing Barca to keep the midfield maestro at the Nou Camp. Iniesta made an immediate impact after coming on in Paris, testing Almunia with a low strike on 52 minutes that was well saved. Arsenal’s best chance of the half then came on 69 minutes, Henry racing through before seeing his low effort parried by Valdes. That moment turned the final on its head, Rijkaard responding by bringing on the more offensive full back Juliano Belletti to replace Oleguer Presas. Barca levelled the scores on 76 minutes, Henrik Larsson (playing in his last match for the club) sliding a ball through to Eto’o, who this time made no mistake and slotted the ball in past the near post. Arsenal hearts were then broken four minutes later, Belletti charging down the right hand side before pulling the trigger and firing home. The Champions League trophy proved to be Rijkaard’s last to date as a manager, having gone trophy-less in his final two seasons at Barcelona. He then joined Galatasaray in 2010 before a short spell as boss of Saudi Arabia. The scorer of the winning goal, Juliano Belletti, stayed at the Nou Camp until 2007, when he joined Chelsea. Samuel Eto’o would go on to play for Inter Milan under Jose Mourinho, winning his second Champions League winners’ medal in 2010. Arsenal have, to date, never reached another Champions League final – at the time they were the only London club ever to reach UEFA’s showpiece event but Chelsea reached the final in 2008, losing to Manchester United, before winning the trophy outright in 2012. Thierry Henry suffered an injury-stricken 2006/07, making just 17 appearances for Arsenal in the league, and he left for Barcelona the following summer. Sol Campbell, the scorer of Arsenal’s only goal on the night in Paris, left the club that summer, joining Portsmouth on a two year deal. He was a key part of the defence that won the FA Cup under Harry Redknapp in 2008, and was named captain quickly after he arrived at Fratton Park. Arsenal’s spending was heavily restricted after to the building of the Emirates Stadium in the years ahead but Wenger stayed true to his word and committed himself to the club, the Gunners reaching the Champions League group stages every season until 2017.